Bad is stronger than good refers to the phenomenon that the psychological effects of bad things outweigh those of the good ones. Bad usually refers to situations that have unpleasant, negative, harmful, or undesirable outcomes for people, while good usually refers to situations that have pleasant, positive, beneficial, or desirable outcomes for people. Bad things have stronger effects than good things for virtually all dimensions of people’s lives, including their thoughts, their feelings, their behavior, and their relationships. Few topics in social psychology have approached the generality and validity of bad is stronger than good across such a broad range of human behavior. The bad is stronger than good phenomenon is at the heart of a centuries-old debate, namely, the relative importance of good and bad forces in the struggle of humankind. History is replete with stories on gods and devils fighting to get the upper hand on humanity. 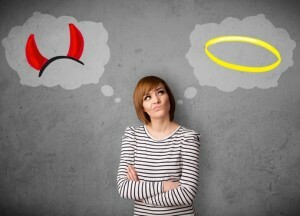 In everyday life, people are confronted with a continuous battle between what is good and what is bad. These battles may concern important issues, for example, behaving altruistically, such as by missing an important interview to help a friend, versus behaving selfishly, such as by refusing to help a friend to attend the interview that may double one’s salary. They may also concern mundane issues, such as eating a healthy meal versus devouring a meal at one’s favorite junk food restaurant, staying sober versus drinking a glass of beer, or studying for one’s exam versus going out with one’s friends. Reflecting its importance in people’s lives, almost everybody, even little children, know the difference between what is good and what is bad. What form does this eternal struggle take in social psychology? Ample research in social psychology provides evidence showing that bad is stronger than good. That is, negative events have a greater impact on us than positive events. For example, people are more distressed by the loss of $50 than they are made happy by finding $50. This does not necessarily mean that bad will triumph over good. Some researchers suggest that good may prevail over bad by outnumbering it. To illustrate, within good, lasting relationships, friends and intimate partners have approximately five good interactions for each negative interaction. Thus, many good interactions can override the negative effects of one bad interaction. Given equal numbers of good and bad, however, the effects of bad ones are generally stronger than those of the good ones. The most recognized reason that bad is stronger than good is evolutionary. Organisms that are attuned to preventing bad things are suggested to flourish and thrive more than those oriented primarily toward maximizing good things. A person who ignores the danger of fire may not live to see the next day. A person who ignores the pleasures of a fun night out may lose nothing but that, a fun night out. People’s survival and well-being thus seem to require more urgent attention to avoiding bad outcomes than to approaching good outcomes. A broad variety of evidence confirms the relative strength of bad over good. Probably the strongest evidence is provided by research on relationships. Initially, it was argued that human beings have a fundamental need to belong, their central task and goal in life being to sustain a network of close, positive, and long-lasting relationships. As it turned out, however, the need to belong does not concern a need for positive interactions as much as a need for non-negative interactions. A closer look at the evidence from relationship research does indeed suggest that the harmful effects of bad relationship characteristics outweigh the beneficial effects of good characteristics of relationships. Typically, in studies on relationships, couples are videotaped for about 15 minutes during which they talk about various topics such as their marital problems or how their day went. Couples’ verbal and nonverbal behavior during these interactions is registered and coded as positive or negative. Overall the evidence is clear and consistent that bad is stronger than good within relationships. However, bad is stronger than good is not just a relational phenomenon, but reflects a general principle among a broad range of psychological phenomena. For instance, research on how people form impressions of others has found that negative information receives more attention, is processed more thoroughly, and contributes more strongly to an impression than does positive information. Similarly, in the language of emotions and emotion-related words, there is consistent evidence that humans have many more (one-and-a-half times more) words for negative emotions than for positive emotions. With respect to self-esteem, perceptions of rejections appear to be much more important to people’s self-esteem and sense of worth than perceptions of acceptance. Research on affective forecasting shows that people overestimate the enduring impact of negative events much more than they overestimate the effect of positive events. As a final example, threatening faces in a crowd are more rapidly detected than are smiling faces.